Samhain is probably one of those holidays that most people don’t even realize is vastly Pagan in tradition. The evolution of Halloween is one of the clearest routes of insight into the merging of Pagan traditions with other traditions throughout the world, especially Christianity. As I have been helping people see what a Samhain feast could be like, I find myself getting tangled in more modern Halloween party websites. The lines between Samhain and Halloween are very blurred. For more information about Samhain, please refer to my blog called, “Samhain, the witches’ new year” posted on October 17, 2011. Soul cakes were traditionally baked as a gift for the spirits of the dead. In many European countries, the idea of “Souling” became an acceptable alternative for Christians. The cakes took many different names and shapes — in some areas, they were simple shortbread, and in others they were baked as fruit-filled tarts. Still other regions made them of rice flour. Generally, a soul cake was made with whatever grain the community had available. You can make your own with one of these four simple recipes. 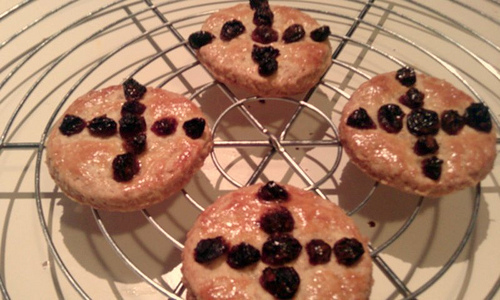 Soul cakes are the ancestors of trick-or-treat candy stops. Beggars were given these cakes with prayers for their departed loved ones. In essence, one cake saved one soul. They were also given to costumed entertainers who were called mummers. This is where wearing costumes on Halloween for treats comes into play. It’s a good idea to keep soul cakes on hand during the Samhain season because, as we give sustenance to people we encounter, we are providing them with food to get through the dark months and we must think of the deaths of people as well as the natural death of the earth in winter. Give your loved ones and friends a soul cake. As you do, bless their ancestors and wish their departed souls peace. There are dozens of soul cake recipes out there but here are some that are easy. Cream yeast with 1 tsp sugar & 1 tsp milk, let it get frothy. Blend flour, spices, & salt together, then cut in butter. Add the rest of the sugar to the flour mix and blend. Add milk & beaten egg onto the yeast mixture; combine with flour mixture. Beat until stiff. 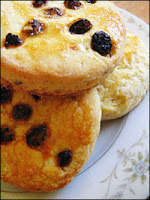 Fold in raisins and zest, cover with a damp cloth and let rise. Divide in two, place each half in greased 7″ round pan. Cover, let rise again for 30 minutes. Bake 1 hour at 400 degrees. It’s always fun to see recipes for soul cakes, and especially with pictures.